Here’s what some of our volunteer facilitators have to say about their own journey with Creative English! Former court clerk turned stay-at-home mum, Tahmeena arrived at training uncertain about whether doing Creative English was really ‘right’ for her, but keen to learn new skills nonetheless. As the training progressed, she expressed increased enthusiasm for the project and an appreciation of what it aims to achieve, as well as her pleasure at having the opportunity to get out of the house and become more involved with her local community. Speaking to her at the End of Contract Volunteer Celebration in Oldham, we were delighted when she said the above before going on to explain that she had always wanted to help people somehow but that she didn’t know if she could – she wasn’t sure she had enough to offer. She said that the most satisfying part of the project for her was the mutual support that she and the learners have found in each other. Tahmeena has voiced one of the most vital aspects of being a Creative English facilitator, and that is that learning and confidence building is a reciprocal process. The relationship that she has built with her learners, and their faith in her ability to lead, equips her to encourage and build them up in turn. She is now volunteering at Holy Trinity Community Centre in Ashton-under-Lyne, with a view to going back into work. Enthusiastic about the methodology, with a heart for the target community and with a charming, ‘people-person’ manner, we knew Nasira would be a strong facilitator from the start. What we didn’t know, though, was that she came to Creative English after completing a gruelling PGCE in Further Education that had knocked her confidence and left her wondering whether she really wanted to go into teaching after all. Speaking to her at the End of Contract Volunteer Celebration in Blackburn, she told me that Creative English has helped her to reconnect with the reasons why she did teacher training, and fully restored her confidence. She has managed to find work with the supply teaching agency Teaching Personnel, and recently went for an interview with Burnley College regarding their ESOL teaching opportunities. Lancashire Council of Mosques, where she volunteers on Creative English, have also taken her on as a paid member of staff on another of their projects. One of our Oldham-based volunteers has said that doing Creative English has given her more ‘street cred’ with her children. Speaking at our Volunteer Celebration event in Oldham, Shamim explained to me that before she started to volunteer with Fatima Women’s Association, in the eyes of her children she was ‘just’ a housewife, but that they have more respect for her now that they can see the difference the project is making, and they even tell their friends that their mum is an English teacher! She also confessed that she has had a dream of teaching adults in a more formal context for a long time, but that Creative English has motivated her to properly look into formal teaching qualifications. Writing on the Department of Communities and Local Government’s Learn English Tumblr, our trainer Charlie and two of our amazing volunteers share their experiences with teaching on the programme. We are pleased to announce that our Creative English Family Learning programme, currently running in Dagenham, has been shortlisted for a British Council ELTons 2016 award for local innovation. This marks the second time that our innovative methods of help local families learn English has been recognised by the British Council in as many years! 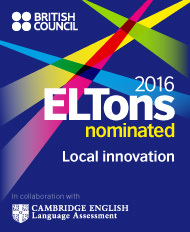 The ELTons, short for English Language Teaching, are sponsored by Cambridge English and are the only international awards that recognise and celebrate innovation in this field. The Creative English Family Learning programme supports families to overcome the significant barrier that many participants — particularly women — face when needing to access English language provision. The creator of the programme, FaithAction’s Dr Anne Smith, found that learning everyday English through fun play-based activities involving the whole family in a safe environment quickly builds trust and community between parents, children and the facilitators. Each session strengthens the relationship between parent and child through craft, role-play, story-telling and games that they partake in together. By focusing participants who would not normally engage with a child-centred activity, it creates a strong foundation in preparation for beginning school. We’re really pleased that Family Learning has been shortlisted. Learning the language is fundamental to everything in life — from achieving in school, to accessing local services such as GPs, or simply being able to ask for what you want in a shop! This course teaches language and skills that parents can use once their child goes to school and beyond. The results of the awards will be announced in June. For more information on the Family Learning programme, be sure to check out the Evaluation Report of a pilot scheme run by 5 organisations across the country in 2015.